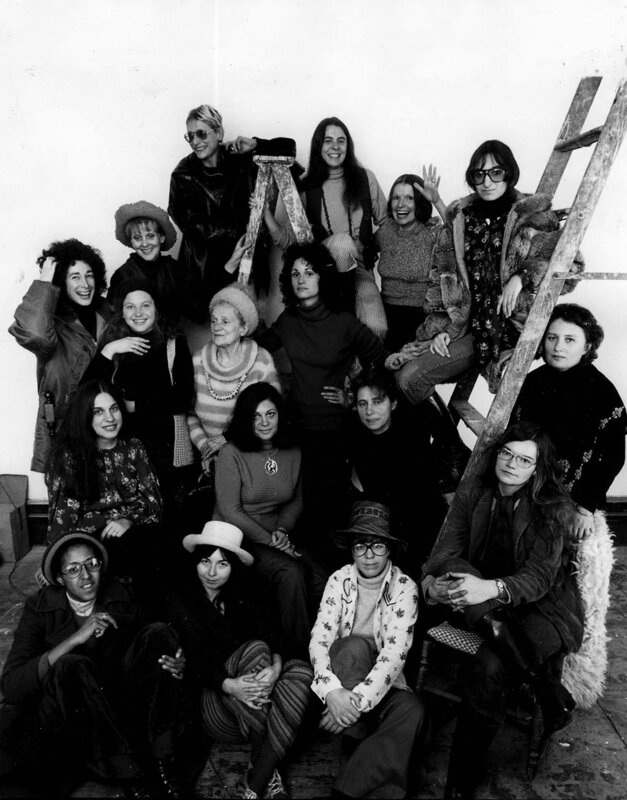 Pictured from left to right, bottom to top: Howardena Pindell, Daria Dorosh, Maude Boltz, Rosemary Mayer, Mary Grigoriadis, Agnes Denes, Louise Kramer, Loretta Dunkelman, Barbara Zucker, Patsy Norvell, Sari Dienes, Judith Bernstein, Laurace James, Nancy Spero, Pat Lasch, Anne Healy, Dotty Attie. A.I.R. Gallery (Artists in Residence, Inc.) was established in 1972 as the first not-for-profit, artist-directed and maintained gallery for women artists in the United States. In 1972, artists Susan Williams and Barbara Zucker were joined by Dotty Attie, Maude Boltz, Mary Grigoriadis, and Nancy Spero and selected fourteen more women artists to form twenty co-founders of A.I.R. Gallery. The group of twenty included Rachel bas-Cohain, Judith Bernstein, Blythe Bohnen, Agnes Denes, Daria Dorosh, Loretta Dunkelman, Harmony Hammond, Laurace James, Nancy Kitchell, Louise Kramer, Anne Healy, Rosemary Mayer, Patsy Norvell and Howardena Pindell. Together they renovated their first gallery space at 97 Wooster Street in New York City, established policy, and incorporated A.I.R. as a 501c3 not-for-profit organization. At the original meeting to form the gallery on March 17, 1972, artist Howardena Pindell suggested the name ‘EYRE Gallery’ for Charlotte Bronte’s Jane Eyre. The artists decided on ‘A.I.R. Gallery’, with A.I.R. shortened from “Artists in Residence”. In the 1960s artists began to work and live in industrial lofts in SoHo previously used only during conventional work days; heat and sometimes even water were turned off at night and on weekends. With artists in residence, the fire department mandated an “A.I.R.” sign on the floors occupied by artists in case of emergency. After much discussion, the founding artists chose the name A.I.R. Gallery, announcing that women artists were now permanent residents in the art world. The gallery doors opened on September 16, 1972, with ten of the twenty gallery artists. The event was covered by a broad spectrum of publications such as Domus, The New York Times, and Ms. Magazine. From the first year, A.I.R. established an internship for students in art-related majors, hosted community-oriented programs, performances, discussions on topics of art and feminism, and initiated invitational shows for non-member artists. As the governing body of the organization, the New York artists of A.I.R. determine the direction of the gallery and by majority vote, accept new artists when there is an opening. Each artist is in charge of her own exhibition; she curates and installs her work, allowing for experimentation and risk not always possible in commercial venues. An archive on the history of A.I.R. is available at The Downtown Collection of the Fales Library and Special Collections, housed in the Elmer Holmes Bobst Library at New York University. In 2006, A.I.R. Gallery’s archive was acquired by The Downtown Collection of the Fales Library and Special Collections, housed at the Elmer Holmes Bobst Library at New York University. A.I.R. Gallery: The History Show, Archival Materials from 1972 through Present, curated by former A.I.R. directors Kat Griefen and Dena Muller was on view at the library’s Tracy/Barry Gallery September 16 – December 13, 2008. The show’s timeline of over 600 exhibition announcements mapped the changing artists and styles of A.I.R. Gallery. Posters, photographs, catalogues, administrative materials, articles, letters, and other correspondence illuminated the growth of the gallery in budget, physical size, and scope of activities and showed the various affiliations of its artists with the larger art world. In celebration of the opening of the archives, a short film directed by Meredith Drum, In Residence: A History of A.I.R. Gallery, was screened. Concurrently, A.I.R. Gallery: The History Show, Work by A.I.R. Artists from 1972 to the Present, curated by Kat Griefen and Carey Lovelace, was presented in A.I.R.’s new Brooklyn location October 2 – November 29, 2008. The historic two-part exhibition brought together artworks by more than 75 of A.I.R.’s family of members. The History Show offered an overview of individual artistic achievement and the organization’s commitment to artistic diversity and authenticity, regardless of the trends in the contemporary art world. While all the artists participated in the feminist structure of the gallery, this first full overview showed the groundbreaking work the gallery’s individual artists made in a number of pivotal movements, such as environmental or earthworks, new feminist strategies, and innovations in the use of unconventional materials. All media were represented: photography, sculpture, painting, performance, videos, sound work, installations, performance, and drawings. This diversity of approach has been the hallmark of the artists at A.I.R. Gallery from 1972 to the present. The women who have contributed to A.I.R. Gallery for forty years do not constitute a particular movement or school. Instead, the women are a cohesive, vitally important social force with a commitment to A.I.R. Gallery, and, by extension, a dedication to the social, cultural and political priorities that A.I.R. Gallery represents.